Includes Beating Bad Breath — The CURE! ebook, with PROVEN step-by-step instructions to ELIMINATE BAD BREATH. Contains the MOST POWERFUL products available to successfully eliminate bad breath — no filler products like mints and gum! Active chlorine dioxide formulation instantly neutralizes odor-causing bacteria — NO MORE BAD BREATH! Best overall value when compared to other professional strength breath kits. PROVEN Step-by-Step Instructions to ELIMINATE BAD BREATH! 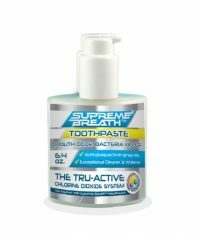 The only Tru-Active chlorine dioxide formulation available contained in the Supreme Breath™ mouthwash and toothpaste. Instantly eliminates bad breath by destroying the odor-causing bacteria where they hide — on the tongue and between teeth — and neutralizes the odors of bad breath on contact. This clinical strength formulation is tough on odors, not on mouth tissue. Complete instructions on how to use gauze for the best and most effective results to eliminate tongue odor. 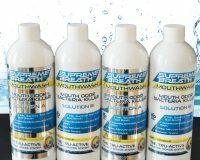 When combined with Supreme Breath™ mouthwash, you will be able to scrub and penetrate even deeper layers of bacterial coating, instead of only the top layer that tongue scrapers reach. Proven at the National Breath Center as the most effective way to eliminate tongue odors. Supreme Breath™ Confidence Pump Travel Bottle is a specially designed dual pump bottle that easily fits in a pocket or purse and allows you to feel confident about your breath no matter where you are during the day! 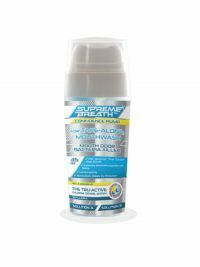 2 Sets Supreme Breath™ Tru-ACTIVE CL02 Chlorine Dioxide Mouthwash, a total of four bottles x 16 oz! (64 oz.) — a $60 value — more than any competitor! 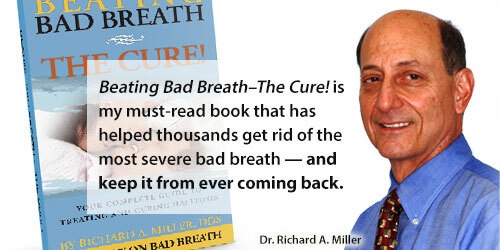 E-Book copy of Beating Bad Breath – THE CURE! — a $9.95 retail value. This book contains invaluable information on bad breath. Written by 25-year bad breath expert, Dr. Miller provides you with an easy, step-by-step program using the products contained in this system so you can successfully get rid of bad breath at home. No guessing on how to use the products! You’ll learn what to do, how to do it, when to do it and even how to modify the program to fit your lifestyle.